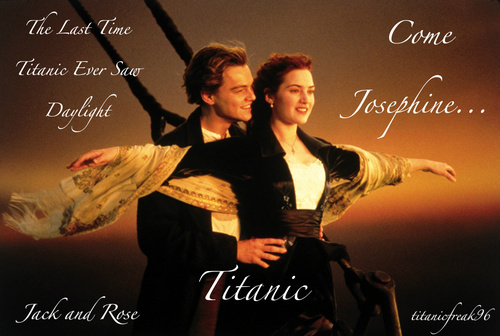 The Romance of titanic. I took a picture of "Jack and Rose" and edited it with words on Fotoflex. HD Wallpaper and background images in the titanic club tagged: jack dawson rose dewitt bukater leonardo dicaprio kate winslet 1997 movie. This titanic fan art contains show and concerto. There might also be guitarrista, violonista, vestido de cocktail, bainha, bem vestido pessoa, terno, calças de terno, terninho, pessoa bem vestida, terno das calças, pantsuit, and terno de calça.